"... Obviously not a review, just a comment. I've pretty much used all the pre-workouts out there and this is really the best profile. I'll be using this and posting my review.. but just already knowing what the ingredients are and the proper dosing these guys did it's going to be great, no question. (Awesome site btw, keep it up!)" 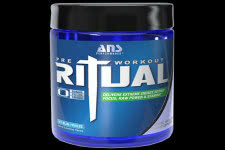 ANS really has the final say with pre-workout drinks with their unleash of Ritual! Sure, you've probably heard it before but in reality upon full detailed inspection you will realize that you get exactly what you need and nothing of what you don't. It's really the perfect ingredients at the right dosing which is critical these days as so many other brands are critically under dosed leaving you taking 3-4 scoops to get any effect. The menu with Ritual includes 3,200mg of Beta Alanine, 3,000mg of Creapure, 2,500mg of Betaine, 3,000mg of L-Citrulline, 1,000mg of AgmaPure and 200mg of Xanthaurine! You will find it extremely difficult to match this formula especially at the dirt low pricing as well as amazing flavors that you can enjoy rather than plug your nose and chug. 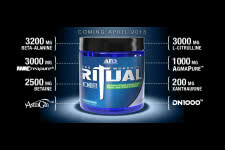 When it comes to investing in supplements especially on a budget, it's great to know that options such as Ritual exist! Un-Matched Ingredient Profile - The Current Pre-Workout Leader!